Everyone loves pasta, but to most of us it just appears in a nice shiny bag on the supermarket shelves–we have no idea how it is made. So how do you make pasta? Well, it’s really easy and actually only has 2 ingredients. It’s so simple. 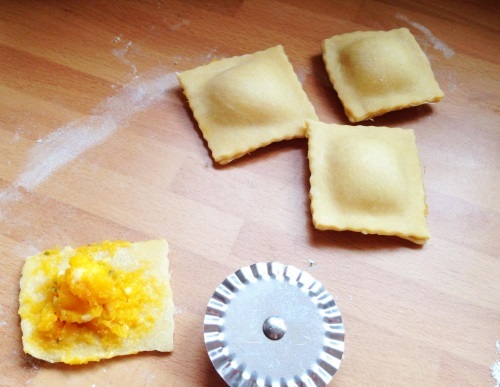 We’ll take a look at how to make a basic pasta that you can make into whatever shape you want, and then we’ll make a nice filling so you can make some yummers butternut squash and sage ravioli (pasta parcels) if you have time. 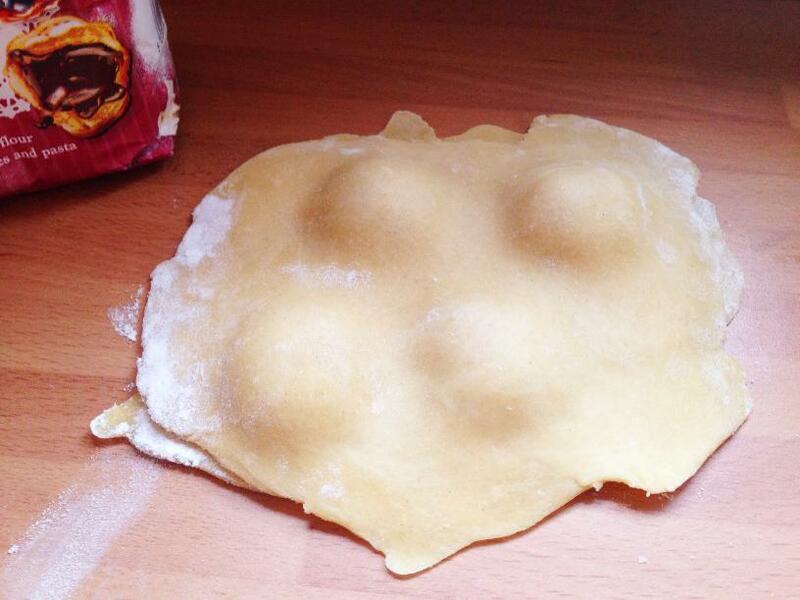 NOTE: If you are making the ravioli, skip down to the ravioli filling section first. Instructions within there will tell you when to make the pasta. 1. 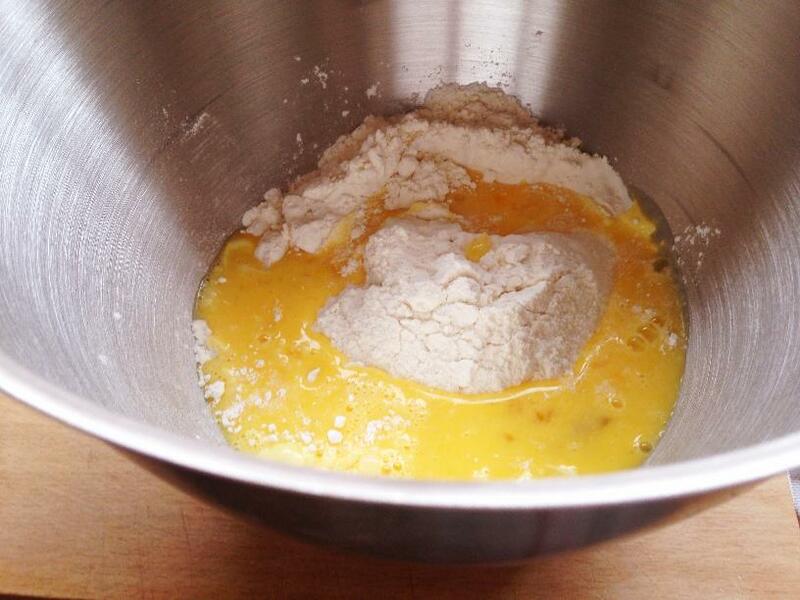 Sieve your flour into a bowl and add the eggs. Start to mix with a fork and then with your hands. 2. 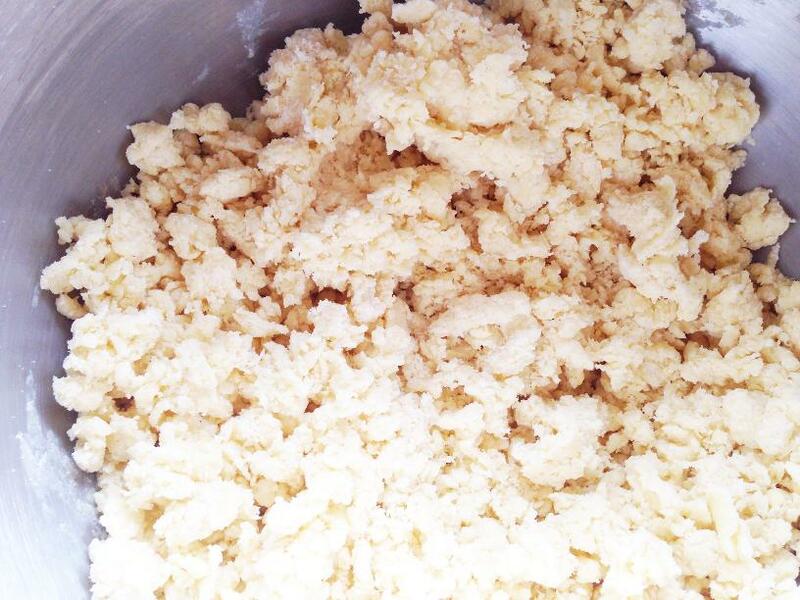 When it starts to look like large breadcrumbs, tip it out onto a floured surface and knead it. If the mix looks too dry then add some water. 3. 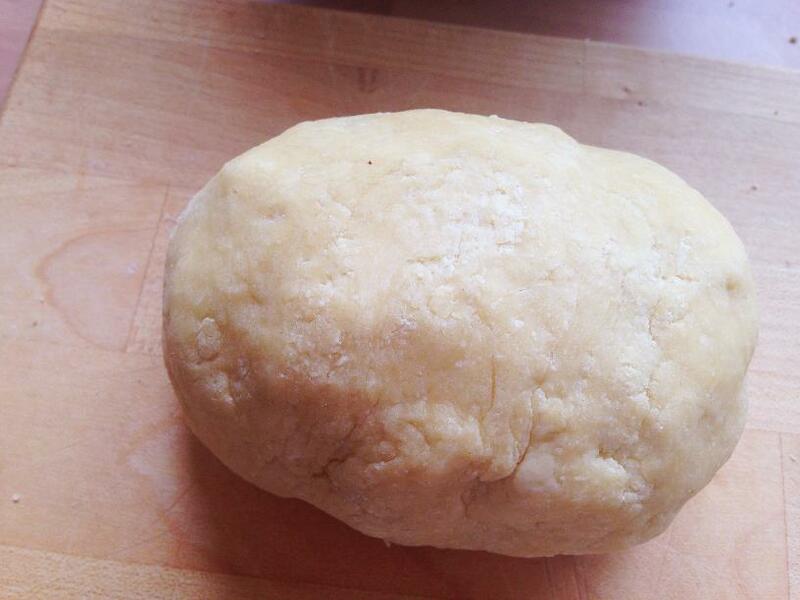 Keep kneading until you get a smooth dough–it will not be as soft as a bread dough. Wrap in cling film and put it in the fridge for 15 minutes–this makes it easier to roll out. 4. If there’s is a pasta machine in your kitchen then it will make rolling the pasta dough much easier, but it’s not necessary. If using a rolling pin to roll out your dough, use really small amounts of dough at a time, and roll as thinly as you can. You could cut your pasta into strips, cook it, and use your favourite pasta sauce right now and it would be delicious. 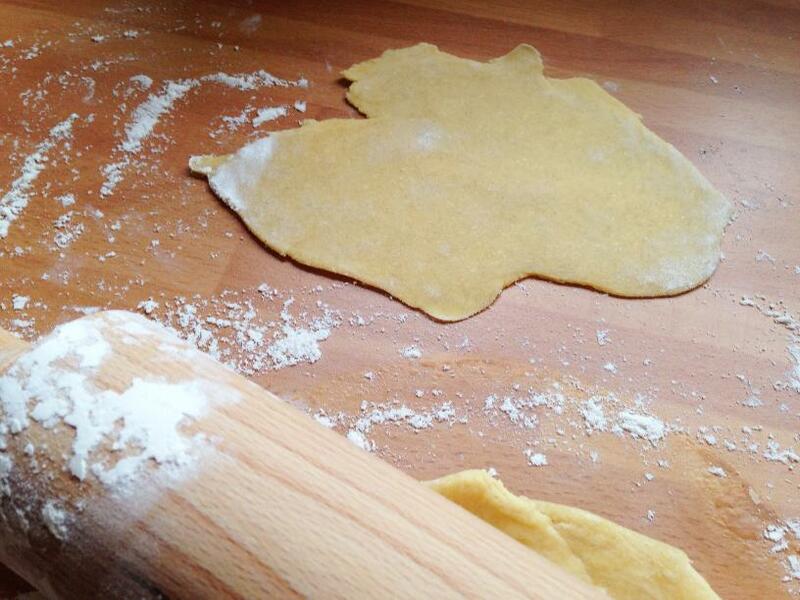 Or you can carry on and make ravioli with us–just make sure to keep the pasta covered and refrigerated until you need it, otherwise it will dry out. There are over 650 types of pasta available in Italy. 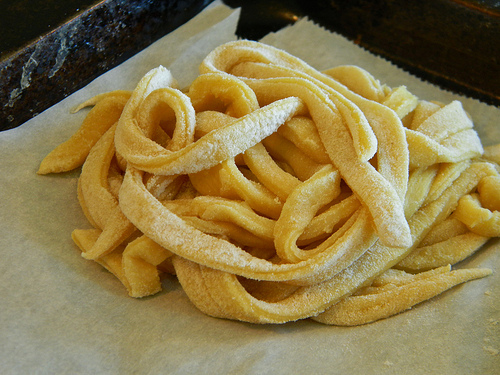 Pasta strips like those on the right are called linguine. What other pasta shapes can you name? Heat your oven to 180c, 350f, gas 4. 1. Get your grown-up to cut the squash in half lengthwise and the garlic in half widthwise. 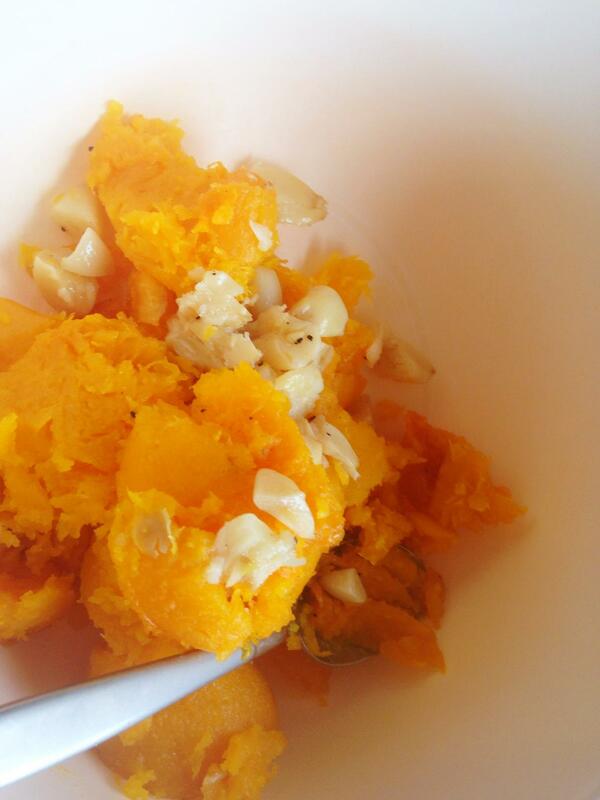 Use a spoon to scoop out all the seeds from the squash. 2. 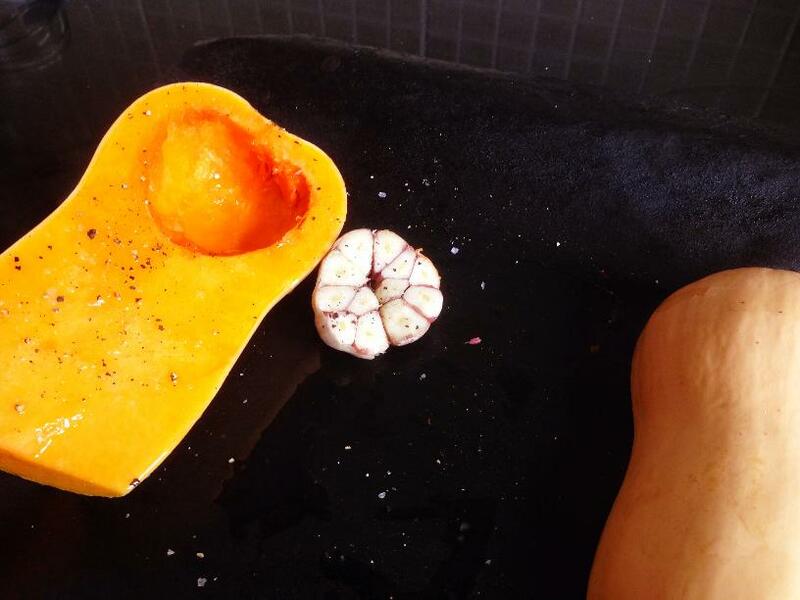 Put both halves of the squash onto a baking tray along with both halves of the garlic. Drizzle olive oil over the top with a sprinkling of salt and pepper. 3. Turn the squash over, hiding a garlic half inside each squash half in the space where the seeds were. Roast in the oven for 45 minutes. While the veg is roasting, you can start to make the pasta. 4. Once the veg has cooled, squeeze the garlic halves into a bowl so the cloves inside slip out of their skins. 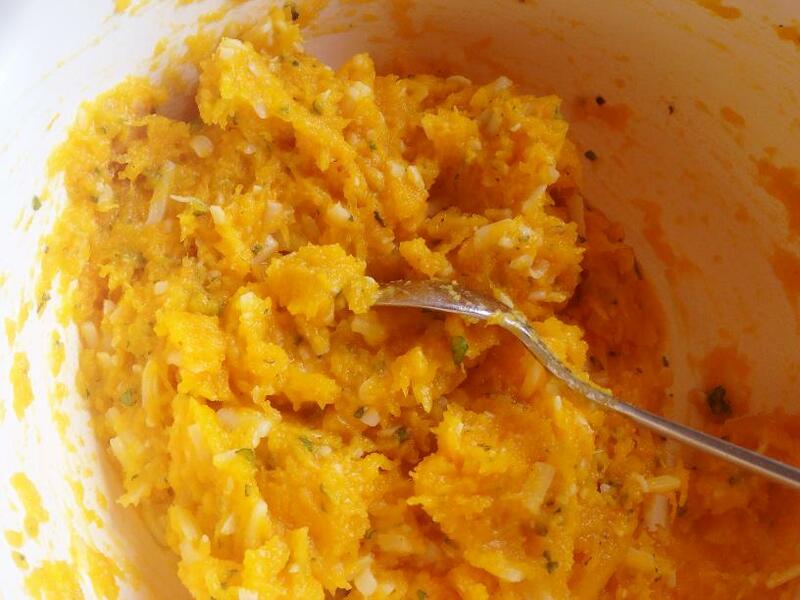 Scoop out the squash with a spoon and put it in the same bowl. 5. Stir in the cheese and sage until you have a nice mix. 6. Put a bit less than a teaspoon of mix onto one of your pasta sheets. Dot them around, leaving a gap of 2-3 cms between each dollop of mix. 7. 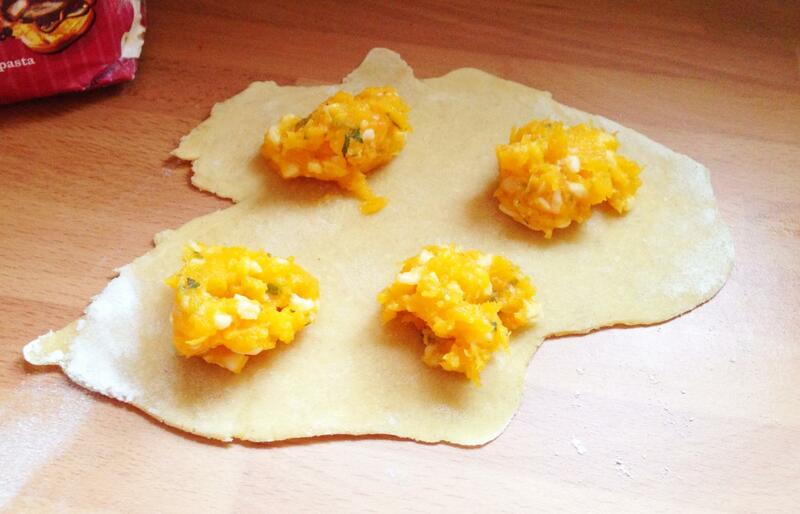 Cover it over with another pasta sheet, and use your fingers to mould the pasta around each spoon of mix. 8. Cut around each parcel, leaving a 5-10mm seam and press firmly around each parcel until it’s sealed. (We used a cutting wheel but a knife is fine). 9. 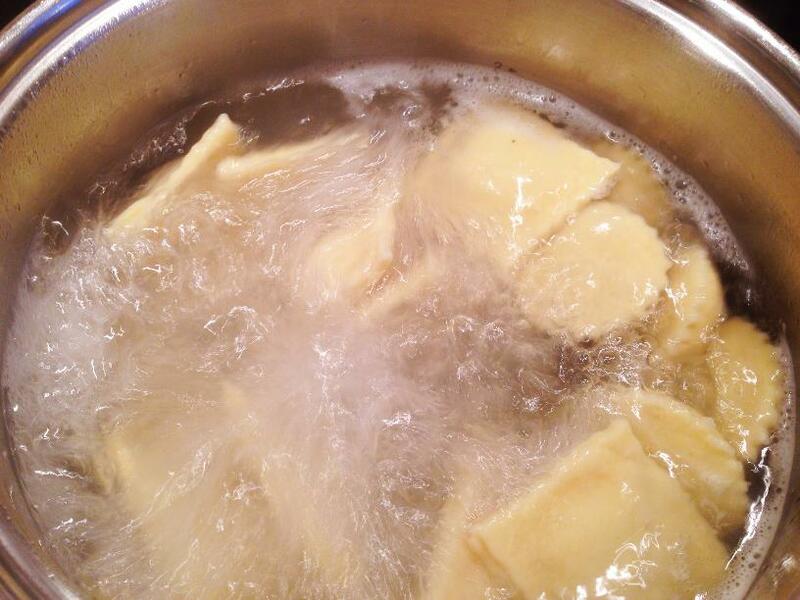 Boil a pan of salted boiling water and get your grown-up to put in your ravioli. When they bob up to the top (about 3 mins) you know your pasta is done. Use whatever sauce you like to coat your pasta. We just used some ricotta cheese thinned down with some of the pasta water and a bit of extra sage. Yummers! 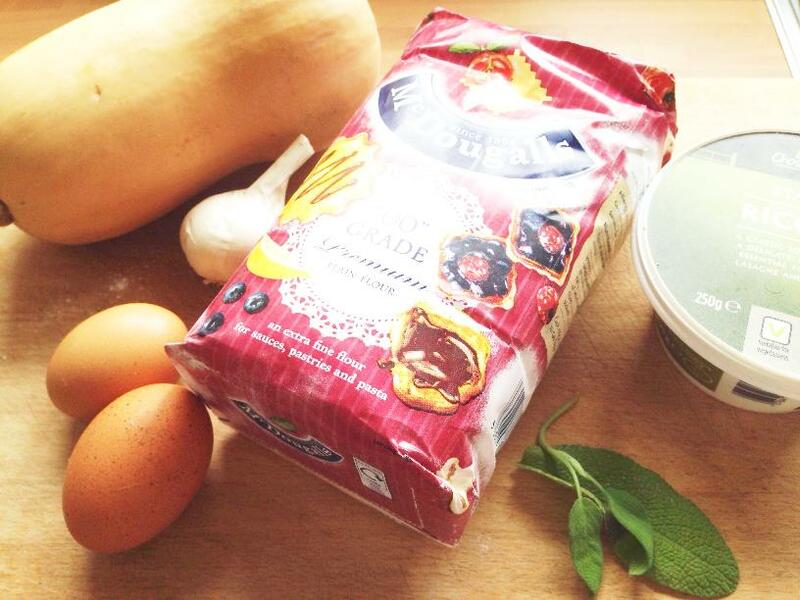 These ravioli can keep well in the freezer and just be cooked whenever you need them (no need to defrost). 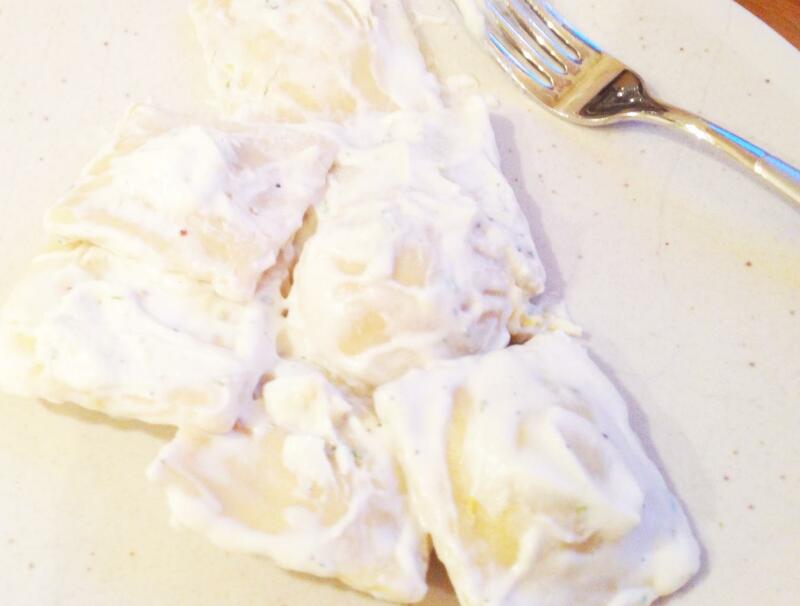 If you had fun making your own pasta then remember to let your friends know.